Piglet is a very tiny pink pig. He is extremely timid and frightful, partially due to how very small he is. He also has a very unconfident disposition about himself. This is all despite the fact that - when the need arises - he often can come up with some very nice solutions to problems. 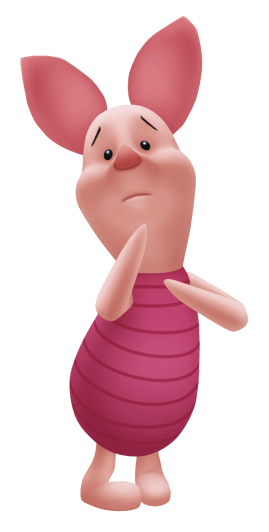 Piglet also holds Pooh in very high esteem, regarding him as his very best friend in all of 100 Acre Wood. Sora first runs across the scared little piglet when going to Pooh's very favorite honey tree. Piglet is heard frightfully shouting for his friend Pooh. When Sora approaches Piglet, Piglet jumps into a panic and runs away. After some consolation Sora is able to procure Piglet from his running and hiding and shows Piglet that Pooh is there. Piglet is then able to give Pooh the balloon that Pooh asked for so that he may float up the tree to get some honey. One of Pooh's friends who lives in the 100 Acre Woods. He tends to be catatonic and mildly paranoid, and being as tiny as he is hardly helps his anxiety any. Still, knowing he has friends he can rely on like Pooh and Sora helps get him through the day. Being as tiny as he is, Piglet was easily blown away by the violent breezes of Windsday. He was rescued thanks to Sora and Pooh's bravery, and was always there whenever Sora tried helping Pooh remember everyone. As a result, about the only person who was happier than him when Pooh finally remembered everything was Sora, who was the last one the bear remembered.